The Madden NFL game has been around for just over three decades now and owes its success to many things. At the forefront is the guy who continues to lend his name to the video game, John Madden. He’s a legend in the game, literally and figuratively, as he was a participant in the NFL and then helped to make the Madden video game a hit. Wednesday (Apr. 10) marks the man, the myth, the legend’s 82nd birthday. Since 1988, John Madden has endorsed and lent his personality to the Madden video games. That’s included giving feedback to developers, providing commentary, and even playbooks for in-game use. The game continues to show itself as a measure of success for sports video games. The first version of the game was called “John Madden Football” and only worked for PC in MS-DOS format or for Apple II, Commodore 64, or Commodore 128 computers. Luckily, 1989 saw it available for the Sega Genesis and Super Nintendo (SNES). It would basically remain on those platforms through the 90s. Over the years there were editions released as new video game systems arrived. The game would arrive for Windows PCs in 1995 and onto Sony PlayStation in 1996. The game hit the N64 starting in 1997 and continued to evolve each year. The last time the game used the name “John Madden Football” was in 1994 for the 3DO system. It started going with just “Madden NFL” after that and kept up with the concept through the present day. John Madden graced the game’s cover from 1988 until Madden 2000. Starting with the Madden 2001 game, there were cover athletes exclusively. The Tennessee Titans’ Eddie George was the first to have a cover to himself. Since then, cover athletes have included Rob Gronkowski, Tom Brady, Drew Brees, Odell Beckham Jr., and Richard Sherman. The Madden 19 game features Antonio Brown on the cover as a member of the Pittsburgh Steelers. 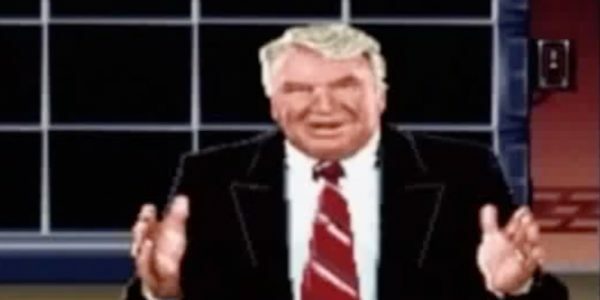 One shouldn’t forget that John Madden is not only a big part of the video game, but he also won a Super Bowl. He was the coach for the Raiders team that won Super Bowl XI. Madden’s overall record through multiple seasons was 103-32-7, a mark many aspiring Madden Ultimate Team gamers might envy. Happy Birthday to the man who started it all. There have been plenty of different cover athletes, versions, features, and updates for the Madden NFL game over the years. However, John Madden is the constant that keeps people coming back to this realistic football simulation. It’s generated billions of dollars in revenue for EA and many hours of fun for gamers. Here’s to John Madden’s 82nd birthday, and many more great versions of his NFL game to come.